The indictment, I now realize, is an under-exploited narrative form. Novels have been written in the form of diaries, case notes, and exchanges of letters, but I can’t remember seeing a novel written as an indictment. It’s got to be an oversight, because the indictment of former Governor Bob McDonnell and his wife Maureen makes the potential clear: Within the constraints of the genre’s just-the-facts style, it still manages to build a sense of character and theme. The big stage is full of important people to impress. But there’s a problem: money. The McDonnells were never rich, and then Bob bought property at the peak of the housing boom. (Bad timing again!) It’s so hard to cast the right image when your investments cost you more in mortgage interest than they generate in rent, and you can’t sell without revealing a huge loss. Where is Maureen going to get the designer gowns she needs for the Inaugural Ball and future formal events? How is Bob going to sport a Rolex or tool around in a Ferrari? How is the McDonnell daughter going to get the kind of wedding that an up-and-coming governor ought to be able to give her? Enter the rich founder of a dietary-supplement company that (like Bob) seems right on the verge of bigger things. Bob and Maureen didn’t meet him until after Bob became governor, but he instantly becomes such a good friend to them — so nice, so generous; all they have to do is ask, and he provides whatever they need. And he asks so little: if the First Couple could only lend his company their names and images and the backdrop of the Governor’s Mansion, if they could lean on the state universities to do some legitimizing research. Once the wrongdoing begins, the McDonnells are such clumsy criminals that you may end up feeling sorry for them. (Sometimes a lie can be so obvious that it’s almost honest.) They conspire in email and text messages. They know their stock holdings look suspicious, so they sell in December, fill out the year-end form, and then buy the shares back in January. Who could possibly see through such clever subterfuge? But don’t worry, Bob and Maureen, a happy ending is on its way. The indictment ends with 14 reasons you should be admitted to a special federal academy, where experienced criminals can teach you how it’s really done. Is he the right comparison? Having looked at the indictment, you should also consider the McDonnell’s defense, which claims this is all politics. Some outside observers also say the case “is no slam dunk” because of “the fine line between what is illegal versus what is unseemly”. The point here is that McDonnell made no specific official action as governor to benefit his “friend”: McDonnell didn’t veto a law or appoint somebody to a state office in direct response to a gift. He sold the trappings and influence of the governorship rather than its constitutional powers. 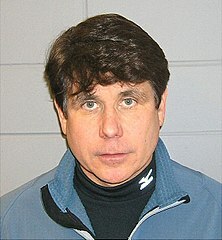 In MSNBC reports on the case, you’re likely to see comparisons to a Democratic governor in jail: Rob Blagojevich, who famously tried to sell the Senate seat Barack Obama left to become president. But a comparison friendlier to McDonnell would be Don Siegelman, former Democratic governor of Alabama, also now in prison. Like McDonnell’s defenders, Siegelman’s (including 60 Minutes) point out that some elements of the classic bribery story are missing: Siegelman did take an official action (re-appointing to a state board someone who had already served on that board under previous governors), but received no personal benefit (the appointee made a contribution to a fund campaigning to bring a state lottery to Alabama, a policy Siegelman favored). In essence, both Siegelman and McDonnell claim that they didn’t cross the line between the man and the governor: Siegelman used his powers as governor to pursue his policies as governor, perhaps in an unseemly way. McDonnell used his prestige as a man (who happened to be governor) to reward someone who gave him personal gifts. In each case, the question is whether the law is being enforced in a politically biased way: How many other politicians could we send to jail under the same standards? And is there a partisan reason why we don’t? Interesting take on the McDonnell story, with some comparisons and a question. I love this guy. When I think of McDonnell’s corruption troubles, I keep thinking of Arlo Guthrie’s “The Cats with the Bugs”. Arlo’s addendum to the Watergate scenario: “mothers still are weeping for their sons who went to war”. As a Virginia resident, I am far more concerned about McDonnell’s odious war on women than I am about his amateurish corruption capers. I know it’s not good for us to have “unseemly” or criminal elements in positions of authority, but I have to wonder why it is so much easier to indict someone for trying to pocket a Rolex than for trying to victimize thousands of pregnant women.